Development prototype for Wessex forthcoming CC Helicon has been proceeding well during our current trip to China, with this project being led by Carl Kleinsteuber of Texas. Here are a couple of pictures. The helicon is not finished as yet, but plays well to pitch with good intonation and a nice rich tone. This is one I look forward to using myself when it comes out for strolling gigs. Dimensions are 20” bell with 0.7” bore. At present it has 4-valves, but we may add 5th later if there is demand. Last edited by Wyvern on Mon Mar 19, 2018 3:46 pm, edited 1 time in total. No detachable bell. And no full circle 4th valve. I guess things need to change when you lose a whole step. 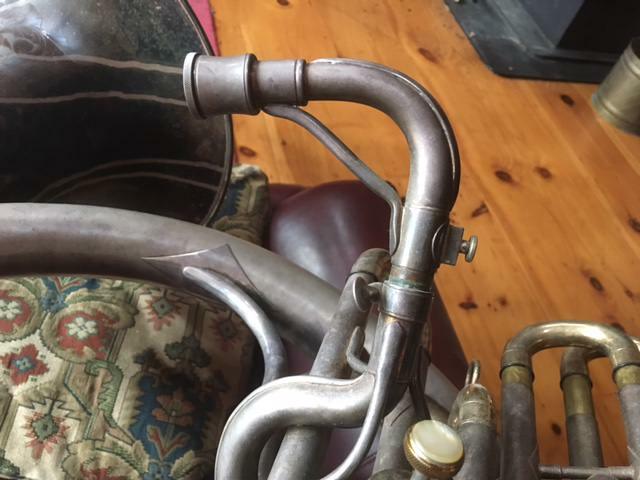 Also, is the bugle from a different maker (preexisting) with a Wessex valve section attached? Kirley wrote: Interesting. Thanks for sharing. Sure looks like it. Looks like an Eb valve section with slides pulled out to CC. Detachable bells on helicons (having built one that way years ago) - in my experience - don't accomplish anything. Even if a hard case is manufactured (at considerable expense, particularly for a very low-volume sales item) to accommodate a taken-apart helicon, the bell height is going to dictate a VERY w-i-d-e case that much more resembles a "trunk"...as if sousaphone hard cases are not already unwieldy. This feature might (??) assist in getting them across the pond (and possibly "two boxes" (each under 130" L+G) via UPS Ground to the consumer might be a little bit cheaper - though higher shipping damage risk - than common carrier), but I don't really see much use for a detachable bell on a helicon...and it adds weight (heavy gauge connection appliances) on top, right where it is not needed. A four-valve instrument - just as with any other 4-valve tuba built in C - will necessarily be a compromised-low-F instrument, with a seller (often) either boasting of some long and easy-to-pull 1st or 4th slide or "great false tones". Seems like it would be easier to get into a car. Mine slides into the back seat of any of my cars (one-piece. There really aren't practical bags currently offered nor (obviously) cases. If Jonathan sells a (one-piece) bag, it's extremely likely that he would have a customer in me. I have one of the Cerveny bags (fits my Buescher like socks on a chicken), but - design-wise - it isn't worth messing with. I have the BBb Wessex Helicon (I picked up the “scratch and dent” one that Jonathan mentioned a couple of months ago). It fits in a Protec gig bag. The bell is a bit taller than the standard sousaphone bell but the body takes up less space due to the lack of an elbow at the collar. That trade off allows it to fit decently. It all depends on where you put the collar. 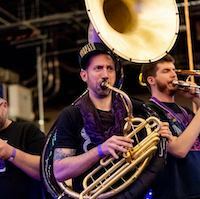 I’d encourage Jonathan to see if he can make the CC helicon bell match another detachable bell tuba collar. Just like the XL did for... was it Martins? Obviously, 2XJ tubas would be an excellent option. But that’s probably a bit large for the CC helicon. Maybe Kings or Olds? I'm fairly sure some of my personal learning curve experiences are being duplicated, here. I ended up with the same downward angle as you have, but with less elevation. Additionally, I made it to where it could be inserted lower than I liked, which allows me to adjust it up to "just right". Finally, I put one of those so-called "AGR" things on it...not to adjust any "gap", but to offer an additional in/out adjustment of the mouthpiece to further adjust the instrument to the player's embouchure's position. BrooklynBass wrote: How’s this coming along? Waiting in line for CAD drawing to be made. 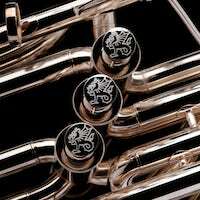 We design new tubas quicker than factory can tool up to manufacture!